Email: Send LeonSkript an email. Private Message: Send LeonSkript a private message. W temacie: 2KK RP SPECIAL! Hey, I am here to invite you to the Formula Locust Championship. If you have any questions, feel free to ask by directly messaging me. Every team has to register for the event by replying to this thread once, following the format given in this thread. In-game/account name of Team member #2, Driver Number. Registration deadline: March 28th, 00:00 (GMT+1). There will be 8 teams of 2 (16 drivers)*, if all spots are taken, your team will be on the reserves in case a team doesn't attend. * - The amount of drivers might change to 8 (Min) or 20 (Max) depending on the demand. Follow the Requirements/Limitations, failure to follow those will result in a disqualification of the racer for the race and/or championship. System from 2010 to 2018 if we have 20 drivers. *¹ - No group will have 2 drivers of the same team in it. *² - If a racer is unable to attend, the group it is part of will start the race without him/her and said racer will receive no points, so please make sure you pay attention to when I call your group to race. Get the fastest total time and fastest lap on each track. 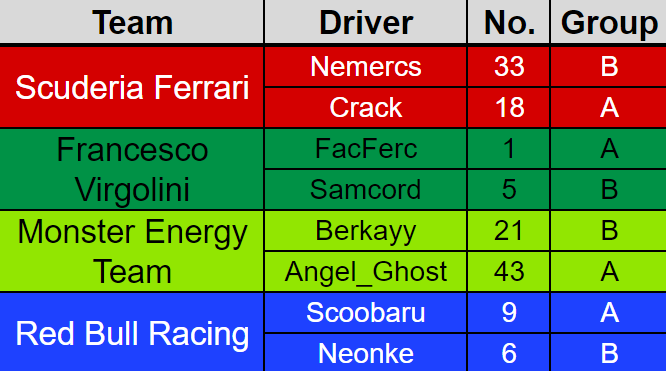 Team's Champion: 7 days of premium for each driver. March 31st, 00:00 (GMT+1) - Window to race closes and reveal of the Driver Standings and Team Standings. Disclaimer: The races are probably going take 20 to 30 minutes per group, so the event might last 1 to 3 hours, so evaluate whether you will be able to stay online for this long. Team Livery with a number from 1 to 99 for each driver. * - Some of these tracks might be on reverse, this will be chosen by the drivers and revealed on March 28th. Disclaimer: Organizational staff is not to be blamed if participants waste money and time for this event. P.S. Special thanks to devs for sponsoring the event. Temat: "I can't login, help"
"I didn't get an e-mail": I made an alt account here to test the registering system and got my e-mail instantly, BUT it was sent to the "Spam Box", check yours, it might be there, same thing for the "Forgot Password" system, the e-mail might go there. "My generated password isn't working": When you register you get an e-mail with a giant random password, and using it usually doesn't work. Mostly the problem is because ctrl+c and ctrl+v doesn't work in here, some websites have that protection and i think this is one, so try to manually write that password OR you can do the whole "Forgot password" thing and get a smaller password, that will be easier to write manually. "I can't login in here, I have an account": This is one I've seen a lot, the main problem is that you probably DON'T have an account here and are trying to login with your in-game info, those won't work, the account in this website is different, you have to make one here THEN synchronize your in-game account with the forum account. I will update this if I see more problems with logins and registration, but even still the website is a bit broken with those so these might not work for you. Your stats and experience with NFS:SA: I have around 765 hours of playtime with 1kk of RP. How much free time do you have to moderate server? : Depends on the day of the week, but I'd say I play for at least 3 hours a day. What do you do when someone starts spamming messages on chat? : Give said someone a verbal warning, if said spam is severe, a 1 minute mute as a warning, if the player keeps spamming, he'd receive a 10 minutes mute or more in some cases. What do you when someone starts insulting other players? : Insults are obviously against the rules and offensive, a 10-15 minutes mute would be applied to said player, if he goes "Yamato/Rei mode" (Insulting an entire nation) I'd get the chat logs for more experienced moderators (Like an SMod) and apply a much longer mute that lasts an hour or more. Do you have any experience (if yes, describe): I used to be a moderator in an Unturned server but I wouldn't call it experience since it didn't last long until the owner shutdown the server. Which language channels can you moderate? : I speak Portuguese and English, would like to moderate these 2 channels if possible, if not possible, I'd focus on Portuguese which is my native language. Why do you want to join moderators team? (at least 100 words): Well, first of all, the server has no moderators for the portuguese language after RaiYou left the moderators team, making the channel rather messy with even more brazilians speaking portuguese in the global channel not knowing they need to use then language channel (or even how to use it in some cases) and being toxic to other brazilians. Second, the more moderators the better for the server to keep the players aware of the rules and their behavior to others (such as... avoiding toxicity). And obviously helping other players in general, with doubts about the server in general, because even to this day the server has some new players that don't know a lot about the server (specially rules, some don't read them). I don't know how long it takes to add a language to the game but I'd like to help you guys to translate the game to portuguese and add that language to the game since there are many brazilians that join the server without knowing how to speak english. If this ends up being read by a developer, make sure to contact me in game (Skript) or in discord (LeonSkript#7705).